With so many attractions it is not strange that Florence is a greatly admired city, and that its foreign colony is large. Concerning the climate some one has said that in the winter and summer one would not wish to live there, but in the spring and autumn one could not wish to live elsewhere. Florence might be called, perhaps has been called, the capital of ‘bric-a-brac-dom’, so numerous are the shops with old coins and curios, so often has a ‘find’ been secured for a mere song. Rome has been called the mother of mosaic, but the mosaic of Florence, made of a few large stones, has a beauty of its own and is by some preferred. It is a specialty of the city, as are artistic furniture and picture frames; but the city has besides neither manufactures nor commerce worth naming, and there is much poverty among the people. The modern Florentine in many traits resembles the Athenian, being quick and subtle in thought, eager for novelty, and endowed with speech ready, piquant, and pure. Many of the foreigners without regular employment come themselves to resemble the Athenians of old, who ‘spent their time in nothing else but either to tell or to hear some new thing’, and many a sharp shaft of wit has been directed against them. 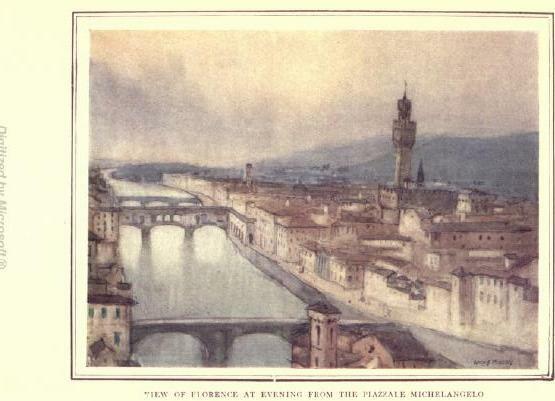 On the other hand, day, who dwelling in a city so suggestive, have not failed diligently to gather and illustrate her treasures of history and of art, and to become to the less favored interpreters of Italy’s glories and need; while noble women, not a few, moved only by love, labor for the moral and material welfare of the people.